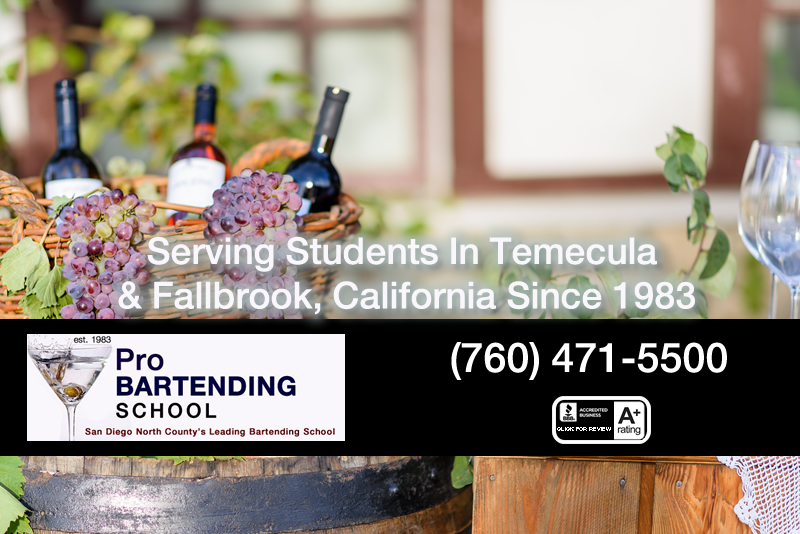 Proudly Serving Temecula and Fallbrook Communities Since 1983. Temecula the land of vineyards and wineries is home to many of our students. They say the Bartending school is a quicker commute off the major freeways than having to drive to Riverside or San Diego and deal with traffic. If you are looking for a school that is near you, consider our San Marcos classroom off the I-78 freeway. We offer behind the bar, hands on training and work as a bartender. Easy and free parking and accelerated classes. A fast-growing community known for its vineyards, wineries and historical sites. Surrounded by communities such as Fallbook and Murietta, the rual feel is nested in the mountains and valleys. Temecula is well known for the yearly Temecula Valley Balloon & Wine Festival.